We were so excited to have Shaun David Hutchinson stop by to chat about his latest book, THE APOCALYPSE OF ELANA MENDOZA. Shaun, what do you hope readers will take away from THE APOCALYPSE OF ELENA MENDOZA? I hope everyone will take away something a little different from the book, but mostly I want readers to know that no matter what anyone tells them, they get to choose. They get to choose who they are and who they want to be and what they do with the talents and circumstances they’ve been given, and no one can take that from them. It’s funny; every time someone asks me this, it changes because advice that seems so useful at one moment in the journey becomes pointless at another. So I think the best advice I could possibly give another writer is simply to figure out who you are and put that on the page. Anyone can write a vampire book or a dystopian, but no one can write your story but you. My first book was The Deathday Letter. A couple years later, Lance Rubin wrote Denton Little’s Death Date. And just recently, Adam Silvera published They Both Die At the End. Three books with a similar conceit—the characters know when they’re going to die and have only a short time before that happens—written by three authors, each very, very different. Because the idea isn’t what’s special. What’s special is what each of us brought to the story. Our lived experiences and the way we view the world. Ideas are a dime a dozen, but you are unique. What was your inspiration for writing THE APOCALYPSE OF ELENA MENDOZA? Mostly I wanted to tell a story about personal choice and consent and the ethics of “the greater good.” I’m also interested in exploring the boundaries between science and religion, and this book gave me the chance to do all of those things while telling a really fun story. When I was younger, I loved fantasy books by Dennis McKiernan because he’d begin each book with a sort of forward that announced some philosophical idea he was going to be looking at. It never got in the way of the story, and I loved seeing that exploration of ideas work its way through the narrative. It’s something I’ve always admired about his work, and I hope I’ve been able to give people something to think about. Elena as a character was really inspired by my mom and my best friend. Not so much that I wrote a character that was like them, but that I wanted to write a character that they would be proud of. Shaun is a major geek and all about nerdy shenanigans. He is the author of We Are the Ants, The Five Stages of Andrew Brawley, The Deathday Letter, fml, and the editor of the anthology Violent Ends. Find out more information at shaundavidhutchinson.com. He currently lives in South Florida with his dog and watches way too much Doctor Who. 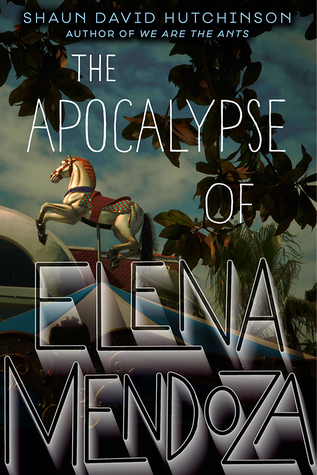 Have you had a chance to read THE APOCALYPSE OF ELENA MENDOZA yet? What can you bring to your story that no one else can? Have you incorporated some personal knowledge or feeling into your WIP? If not, why? Share your thoughts about the interview in the comments!